NYC is the largest metro area in the US and has a huge number of business travelers, hence all three legacy carriers have competed in the city with hubs at either JFK, EWR, or LGA. However, the Motley Fool shares a look into American’s recent pullback in New York as the carrier looks to “emphasize flights to the most important business markets”. Before the merger with US Airways, New York was the only hub for AA and it competed strongly on the JFK-London and transcontinental routes from JFK to LA and San Francisco. For years, American also was the dominate NY carrier to the Caribbean (this was before JetBlue’s build-up and Delta’s growth into the NYC-Caribbean market). 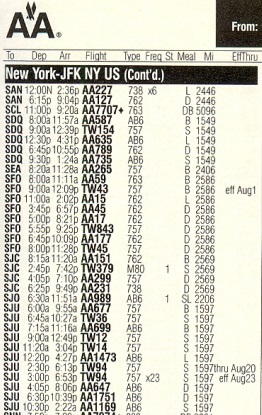 The article notes that many other routes on the AA NYC network were money-losers, including flights to Tokyo. American Airlines tried to shore up its position in New York through an interline and frequent-flier partnership with JetBlue Airways. This allowed it to use JetBlue’s larger domestic network at JFK to supply connecting traffic for international flights there. But cozying up to a major competitor is never a comfortable situation. And even with the JetBlue relationship, American still lagged Delta Air Lines in New York in terms of network breadth. Then the merger with US Airways changed the dynamics for the carrier. All the sudden American had an important business asset in NYC with the LGA shuttle to Boston and DC. More importantly though, American now had a major hub just 100 miles away in Philadelphia. Today, American has 400 daily departures in Philadelphia to over 100 destinations, but less than 100 departures from their still relatively new Terminal 8 at JFK and about 170 at LaGuardia. For the past several years, American Airlines has struggled to make its Philadelphia and New York hubs coexist productively. One thing it did quickly was cancel the JetBlue partnership. It didn’t make sense to be paying JetBlue for connecting traffic in New York when the new American Airlines could just as easily move that traffic through its Philadelphia hub. Unfortunately, this further undermined American’s position at JFK. However, the company felt that it didn’t make sense to pull out of JFK entirely, because of the strong business demand for its London and transcontinental routes. The article notes that as American looks for a viable strategy for its Northeast hubs, the carrier is pulling back international flights from JFK that aren’t considered top business routes. Those have included Manchester, Zurich, and even one of the two daily Paris flights. All of these destinations are served from Philadelphia. Delta who has really double downed in NYC over the last decade offers non-stop service to all of these destinations from NYC as does United from Newark. Barbados always seemed to be less touristy than the other Caribbean locals with direct NYC based flights (less US tourists anyway…very big with the UK). Friendly locals,beautiful uncrowded beaches, and a great Hilton and decent Radisson as well for points redemptions. Award availability was fantastic. My family of four flew Dec 24th returning December 30th in 2013 all on MileSAAver awards. We’ve done that to several other Caribbean location each and every year on AA for 11 years through 2014 (from 2015 and 2016, there was simply no awards to be had given present day American’s stingy availability). Since award availability was so fantastic, there was always Avios availability as well. I was able to avoid a NYC blizzard and escape to Barbados last minute using an AAdvantage MileSAAver award booked via British Airways Avios. The total cost was $47.50 in taxes and only 12,500 Avios points (instead of 17,500 AA miles) each way! At the beginning of 2014, AA was left with non-stop Caribbean service from JFK to only Antigua (ANU), St. Kitts (SKB) once per week, Port-au-Prince (PAP), San Juan (SJU), St. Maarten (SXM), and St. Thomas (STT). A far cry from the days when we’d sit down at the kitchen table and look at AA’s “Where We Fly” map to pick our next Caribbean winter vacation spot, always a new destination on miles. By the end of that year, the St. Kitts once daily flight completely disappeared and the JFK-SJU route was cut to only once per day! Well, in April 2017 we reached the end of an era when American confirmed that it was terminating non-stop service between JFK and San Juan, a former hub, in August 2017. The route had been flown by the carrier since 1971! American continues to serve the market from Charlotte, Chicago, Dallas, Miami and Philadelphia. Take a look at the AA schedule at the bottom of this post from July 2001 with 11 daily flights from JFK to their then hub in San Juan! Of course, the competition is a bit different now. JetBlue has up to 6 daily flights to SJU from JFK and up to 2 from Newark, Delta has 4 from JFK while United has up to 4 from Newark. Southwest also now operates a weekly Newark flight. In announcing these cuts in April 2017, the airline said that they wanted to “re-gain their footing in the lucrative New York market”, however American has clearly now ceded many NYC routes to competitors. Delta now operates from New York to markets that were unimaginable prior to their “win in New York” strategy that began around 2010. If I want a direct flight to the Caribbean or Mexico from NYC, I’m likely flying with Delta, JetBlue, or United. Routesonline has a fantastic piece that looks back at American’s SJU service over the years and highlights how the average fares on the route have remained resilient over the past ten years. Now, there’s one big point that we are leaving out…these changes will improve profitability for the airline as it cuts those routes that just don’t work for them from NYC. The changes also allow the airline to maximize on domestic connections to its international flights at its Philadelphia hub. The JFK hub is a legacy of the TWA merger. It seems that American feels they can connect people elsewhere, although that seems to leave an awful lot of business on the table. Also, in the second paragraph you say that New York was the only hub for AA, where I think you mean that only AA still had a hub at JFK, since they obviously had other hubs. This was very easy to see when the AA/US merger was announced. Either JFK or PHL had to go as a hub. At JFK, they have strong competition on every route. At PHL they have little to no competition at all. It’s easy to see why they chose PHL. Bingo. Year-round the AA flights out of JFK go out very nearly completely full in J and F, while Y in the off season will be nearly empty. No big deal, the premium fares drive profitability. BA, and IB are probably quite happy with the premium situation. The same analogy continues with the transcon market which AA absolutely controls. The ground investment in lounges and other premium services only cements this situation. DL has some volume but the ground experience at JFK leaves a lot to be desired. UA out of EWR can be convenient but ditto the ground experience. The AA flight from Charlotte, helps with some connections out the NE US.. but it needs to be a daily year round , not once a week in season flight. they also need a different aircraft. .what is being used now is an old domestic plan with nothing on it.. or. .change it to Philly and not Charlotte.. but Charlotte works for me..
AA’s total NYC presence is so tragic that in the latest official report showing trailing 12m actual pax volume, AA fell off the Top 3. Picking a random friday (4/13), AA’s is slot-squatting with 6x JFK-PHL and 6x LGA-PHL, with the vast majority of them flown by 50-seater ERJs. Of course AA apologists love arguing how this is another ATL/MEM or DTV/CVG choice of choosing the dominant fortress hub (PHL), but they keep forgetting one thing – it’s NYC we’re talking about. They also love arguing about how AA is all about “business destinations,” so in their minds, routes to places like FRA AMS ZRH are filled with nothing but a bunch of couch-surfing train-hopping backpackers.